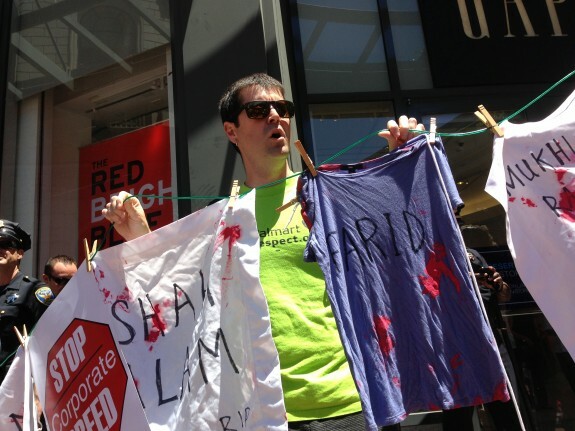 Dan Harper protests GAP’s lack of commitment to workplace safety standards in Bangladesh. Photo by Mindy Pines 2013. Bay Area union organizer Dan Harper, a member of the Executive Committee of the Pacific Media Workers Guild, TNG-CWA Local 39521, dramatized the human cost of Gap Inc.’s clothing supply system during a noontime protest Saturday in San Francisco. The company refuses to adhere to progressive workplace standards despite mounting pressure and international revulsion following the disaster at Rana Plaza in Bangladesh. While international negotiations continue with retailers and manufacturers, worker advocates are taking the fight to the front doors of retailers like WalMart and Gap. Saturday’s protest was staged outside Gap’s flagship store at Powell and Market in San Francisco, where participants condemned the shameful workplace safety standards and corporate not-our-problem attitudes that led to the deaths of 1,100 workers in the Rana Plaza building collapse. CWA participants in the protest called for a consumer-awareness campaign to hit retailers at the cash register if they don’t improve.